Cleo is a 'little girl with a big imagination' — and a knack for coming up with ingenious solutions to problems! Two stories are included in this beautifully designed book for young readers. In the first, 'The Necklace', Cleo desperately wants a necklace of her own, but her parents tell her she'll have to wait until her birthday … which is so … far … away … that Cleo decides she'll simply have to come up with a better plan. Libby Gleeson and Freya Blackwood are two legends of Australian children's publishing. 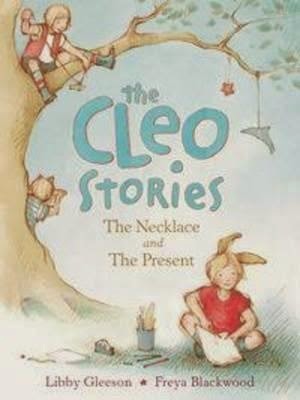 With The Cleo Stories, they've created another gorgeous character whom kids and parents are sure to love. Cleo is an independent little miss who thinks outside the box, loves with all her heart, and gets herself in and out of trouble with flair and enthusiasm! The text is just right for confident independent readers, engaging them in the stories but still providing the odd challenge to stretch those reading skills. And the illustrations on every page perfectly capture all of Cleo's character and charm.